This entry was posted in History, Politics, Religion, Society and tagged Bible, Christianity, creationism, science. Plenty of Christian denominations have accepted evolution as fact. I guess they are SOL as well? Connie, after my final breath my brain will deplete its oxygen and I will no longer be conscious. I will die. I will not be aware of darkness, this requires eyes. My soul will not be standing, this requires legs. There is no evidence for, or explanation of the workings of, a soul. In elementary school when I wrote “wake up one morning and find yourself dead” it was crossed out as being an impossibility. And this was a Church of England (= Episcopalian) school. Grow up, Connie – it’s time to move up to elementary school thinking, and beyond! I have always found this idiotic. This sort of thinking (if one can call it that) scares me witless. I find it incredible that presumably educated people in an advanced society can believe in Creationism. But I suppose it is an indication of the power of the human ability to ‘believe’. Seeing as how evolution is a theory AND a fact I propose that science teachers start referencing it as a fact. The word “theory” causes confusion and should only be used when referencing specific mechanisms of evolution. As much as I would love this to happen, it is difficult to proclaim something as pure fact due to the nature of Science. Science must question all beliefs and all theories. That way we can get rid of the ones that don’t work and build evidence for those that are more valid. If Science ever proclaimed something as pure fact, that can’t be questioned, it would only build a wall in front of it’s own method. I agree with what you are saying here in principle. The people doing the science should always have the freedom to question existing theories and facts. Nothing should be sacred in the scientific pursuit of knowledge and there should be no stone unturned. I am reminded that any science, significantly advanced, is indiscernible from magic.Perhaps then, we merely have not advanced scientifically enough to discern what magic really is. It always amuses me when conversations like the above pop up. It makes me wonder, as the Scientist sneers at all the theories not of science and says they shouldn’t be taught, just what does he have to fear from the transmission of ideas not his own? Surely if Science is the greatest and most complete form of knowledge out there, undoubtedly people would chose it over the Mysteries which are “unscientific.” Yet constantly it seems, the ideas of religion, magic, alchemy, and otherwise, must be driven away and crushed, and only science to be taught. The only ones who fear knowledge other than their own, fear that their knowledge is insufficient and lacking. But hey, I’m just an ignorant Heathen. What do I know? They have the reasonable thought process of “science approved by reputable scientists should be taught in science class”. 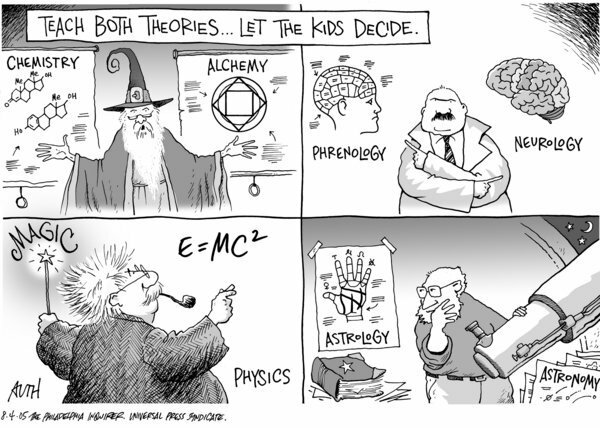 Children are bombarded with all sorts of “theories not of science” outside of the classroom. So now if science teachers want to actually teach science in science class they “fear the transmission of ideas not their own”? What the heck are you talking about? All we are talking about is science class, specifically biology. I guess you are ignorant, you nailed it there. Lucius, I think your interest in magic is useful for personal transformation, meditation and emotional health. It does not have any external validity, however, in the sense of chanting to cause rainfall or saying a prayer to cause the dice to fall the way you want. I am happy with magic being discussed in the context of psychology, but not in relation to science except in the history of early scientific speculation that proved unfounded. I get a bit annoyed when people get aggressive against your views without going through it fully (e.g. Dawkins). However what your saying doesn’t make much sense. Firstly Science is not God, it does not reel people in to naturally believe it. We have to learn about it, and be taught about it. In the same way that as a child we are taken to churches and mosques, giving us knowledge of religion. We do not lean towards any particular religion or belief (although it is preferable to believe in an afterlife for comfort sake), but we are guided by family and community towards it. Scientists were the same, they were guided towards religion, and many of them were and are religious. These scientists believed in creation and everything else. But then one day someone questioned one of the religious laws, and tested it’s validity. They came up with a different result and published it. Keep this questioning religion ball rolling and you find that a lot of the things past of as absolute are not always absolute. Luckily a lot of religions aren’t adamant on things like creationism and prefer to show them as symbolic. Most decent scientists in the end do not turn their noses up and sneer at other theories. They take them into account, test them, and disprove them. It is the creationists and cynics who turn up their noses and refuse to look at the evidence provided. Perhaps so, but science is still so very much in its infancy. There are so many things we have no way to “Study” scientifically. Indeed, the advances we have made in science in just the last twenty years should show a hint of how much science has yet to be able to do. So to say that something is “disprove” when we really don’t have the scientific capabilities to really prove one way or the other, strikes me as rather foolish. And that is not even touching upon those scientists who turn up their noses with a sense of superiority over the “theists” who believe in gods and creation.